Architectural ensemble of Francysk Scaryna avenue in Minsk (1940's -1950's) has been part of the Tentative list of Belarus. 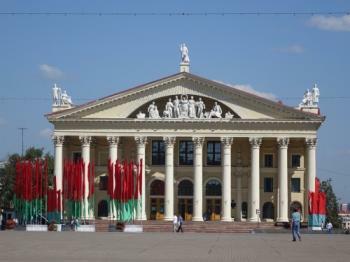 I am not going to make a habit out of reviewing former TWHS, but I sincerely thought that the 20th century Minsk architecture still was on the Tentative List of Belarus. However, it was removed from it in 2015. And that while Soviet (or Stalinist) Architecture is not yet represented on the List. Worthwhile other additions in this category could be The Soviet Architecture of Moscow and The Motherland Calls Statue (Volgograd), both featuring in our Top 50 Missing. Anyway, it would not surprise me if Belarus would renominate Minsk in the future. More on that later. The Architectural ensemble of Francysk Scaryna avenue in Minsk (1940's -1950's) - the full name of the former TWHS - includes the buildings along the city’s 2.9 km long main avenue. It was a harmoniously planned cityscape, constructed in 15 years time after the end of World War II. Minsk had been severely damaged during the war, turning 80% of the houses into rubble. Its architectural design was made by M. Parusnikov, who was selected after a competition. Today the street has been renamed into ‘Independence Avenue’, dropping the name of Francysk Scaryna (a 16th century Belarussian humanist and language reformer). Ian has reviewed this site a few years ago, and I do agree with him that Minsk is a surprisingly enjoyable city. It has a combination of an almost Parisian elegance with a youthful vibe. I first walked this avenue on my way from the train station to my hotel in the city center. The road is very wide (42-48m), suited for militairy parades. Most of the time as a pedestrian you go to the other side via an underpass. One monumental building after the other pleases the eye. The next day I did a self-guided tour of the city on foot and by metro. I was already tired before I reached this street again, so I managed only to walk half way this time. I did so from the Lenin statue to Lenin square, passing for example the Post Office, GUM department store, McDonalds (yep, in a Soviet-style monumental building), KGB headquarters and the Trade Unions Palace. Guidebooks and trip reports warn against taking photos of the statue and the surrounding government buildings, but I was never bothered by police. What struck me was how classicist this architecture was – hence the title ‘Socialist Classicism’. 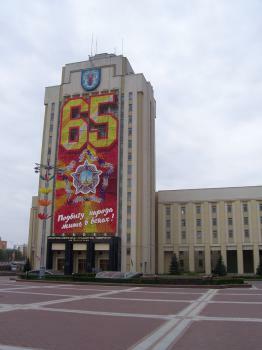 According to Wikipedia, Stalin liked “new, expensive "ensemble" projects which valued facades and grandeur”. This undoubtedly has worked well on this avenue. So what’s up with future plans of making this a WHS? Ian in 2010 found a source that said “the roofs on the pedestrian subways [..] supposedly led to it being rejected by UNESCO as a WHS”. To my knowledge however, the site has never been officially put forward (so it cannot have been rejected). In fact, Belarus in 2013 was still actively discussing Minsk’s WH potential. It took part in an ICOMOS sponsored meeting called Socialist Realism and Socialist Modernism. World Heritage Proposals from Central and Eastern Europe. Countries of the former communist block discussed a possible transnational serial nomination of Socialist Realist monuments. ICOMOS seemed to welcome this: “an important contribution to .... closing gaps on the UNESCO list. Buildings from the socialist period characterise the architectural heritage of the 20th century in Eastern Europe and Eurasia dominated by the Soviet Union. They also represent an important facet of Modernism and of contemporary cultural identity on a global scale...”. And then, when I just got back and was finalizing this review, there's the confirmation: Minsk Independence Avenue to be nominated for World Heritage Site status. For some reason I really liked Minsk. It isn't rammed full of must see sites and isn't really the prettiest place in the world, however I enjoyed the three days I was based here. This proposal for World Heritage listing was what is now called Nezavisimosty Avenue (but in all likelihood this will be renamed at some stage in the future when the Political whim has changed to something else) this is the central street in the city and one that was mostly built in grand Soviet Architecture, following the cities almost total obliteration during the Great Patriotic War (WWII to those of us from the west). It is actually a quite a long ensemble, about 3km, taking in many fine edifices and large sweeping squares. There are still remnants of the Soviet Union; Statues of Lenin, KGB headquarters and GUM Centralised Shop (best place for souvenirs and a taste of shopping soviet style) but these now sit alongside modern capitalist facades, including a huge McDonald's (on the intersection with Lenin Street of all places). We spent a great day walking from Nazalezhnasti Square, decorated for the upcoming 65th anniversary of victory in the Great Patriotic War, all the way through to Victory square. We then ducked of into Gorky park to 'enjoy' a cool glass of Kvass and watch the May Day festivities with the friendly population of the city. This gave us a look at the roofs on the pedestrian subways that supposedly led to it being rejected by UNESCO as a WHS. To my eye they certainly didn't destroy the ensemble, and didn't seem to out of keeping with the general aesthetic of the city centre. I think this would actually make a pretty interesting WHS if it ever is fully considered as there is nothing really displaying this grand Socialist Realist planning on the list, and central Minks is a particularly fine example. We had heard some pretty grim stories about Minsk, however it was an exceptionally welcoming place. It was the cleanest city I have ever visited, not a bit of litter or peeling paint to be found anywhere. Also English was spoken much more widely than we had been led to believe, though it certainly wasn't spoken everywhere. We had some fine food, and found some excellent bars, My English Granny being the pick of the bunch. Minsk was nowhere near as intimidating as we had been led to believe, and this was reflective of our whole experience in Belarus. This was a really friendly and welcoming country to visit, and I think central Minsk would make a pretty interesting addition to the World Heritage List should it ever be considered.